These oven-baked meatballs with tomato sauce have a long history for me. Classic pan-fried meatballs and sauce was one of the first dinners I learned to make from scratch as a kid. Not long after I mastered them, I switched to the ease of baking the meatballs in the oven and I’ve been serving them up, in various forms, on a regular basis ever since. In my early twenties, I had a little business cooking and delivering heat-and-serve meals to busy families. Meatballs and pasta were the most popular dish on the menu, something I was never surprised about. For me, they tick all the boxes for both making and eating: comforting, savoury, simple to put together and brilliant as a freezer meal. Plus, both the meatballs and sauce will happily accommodate hidden vegetables, if you’re trying to boost the intake of any fussy eaters. Why should you cook meatballs in the oven instead of a frypan? I realised early on in my cooking career that if you want to make a lot of meatballs, oven baking is far less messy and more time-effective than pan frying in batches, with very similar results. I used to cook my sauce on the stove and just pop the oven-browned meatballs into it as they were ready. In recent years, I’ve simplified the method again, partly through my aversion to cleaning more pans than necessary but mostly through the sheer necessity of getting dinner on the table faster for hungry kids. I now cook this entire dish in my combi steam oven, using a single pan for both meatballs and sauce. The meatballs work equally well in a regular oven with a few small tweaks for time and moisture content, and in a blind test, it would probably be hard to tell the difference between the regular oven version and the steam oven version. They do cook a bit faster using steam, though, so it’s become my go-to. What type of meat should you use in meatballs? 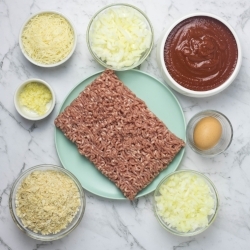 When it comes to the meat you use for your meatballs, you can pretty much choose any type of minced meat you like. My preference is for a mixture of pork and beef (roughly 50/50), and that’s what I’ve included in the recipe. The pork makes for a tender texture and you’ll get some savoury heft from the beef to balance it out. Beef alone will give you very hearty meatballs, with a slightly firmer texture than the mix of the two meats. Minced chicken or turkey can also be used for meatballs, just be aware that chicken ones are quite delicate in texture and can break up in the sauce. If you like the idea of chicken meatballs, but don’t want them to be too soft, see if you can find some decent fresh chicken sausages (in Australia, most butchers and supermarkets carry them). The sausages contain binding and thickening agents which help stick everything together a bit better. 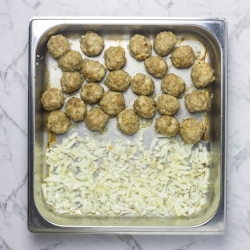 Remove the casings and use half sausage and half regular minced chicken in the meat mixture, which will create meatballs which are robust enough but not too ‘bouncy’, as they would be with just sausage meat. Be careful adding seasoning to the mix if you use sausages, as they’ll bring a fair amount of salt to the mixture. I sometimes ‘hide’ finely shredded or minced vegetables in my meatballs, which is a great way to get a bit more veg into my household’s youngest and fussiest eater. A shredded carrot works well mixed through the meat, as does zucchini. If you use zucchini, shred a whole smallish one or half a large one, then squeeze out as much water as you can before adding it to the mix, otherwise you’ll end up with mushy meatballs. Mushrooms are a nice addition to the sauce, giving it a depth of colour and flavour you don’t get from tomato alone. The kids don’t even notice them once everything’s cooked. I use a couple of big handfuls of button mushrooms, blitzed into tiny flecks in my food processor. Add them into the pan when you cook the onion and garlic for the sauce. If ever there was a recipe you could make and serve on repeat, to acclaim from young and old, this is it. I hope you’ll try cooking oven baked meatballs in your steam oven or regular oven soon, and that they’ll become a firm favourite at your place the same way they are at mine. You can absolutely make these and eat them as soon as they’re cooked. That’s what we do, though most of the time I make a double batch for a second easy dinner later in the week, and I always think the leftovers have a better balance. If you can give them a day or two in the fridge, the meatballs get a chance to sit in the sauce and let all the flavours mingle together. I always use smooth tomato passata (puree) to make my sauce, though crushed canned tomatoes are more traditional. It’s just a matter of preference, so go with whatever you’d normally use when cooking a tomato-based sauce. If you’d like to scale these up to make enough for a crowd, you can easily double or triple the recipe. 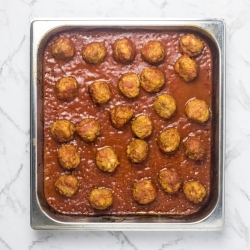 I’d recommend if you’re making an enormous batch that you bake the meatballs in one (or two) pans, and the sauce in a separate one (a deeper pan is perfect for the sauce in this instance), before combining the two at the end of cooking. These meatballs freeze well, just make sure they’re well-covered by the sauce to prevent freezer burn. Thaw them fully in the refrigerator before reheating, otherwise you’ll find yourself bashing up an icy mass in a pan, trying to thaw dinner without turning the meatballs into Bolognese (ask me how I know this). You’ll see there are methods for both combi steam and conventional ovens below, so you can choose whichever suits. Preheat oven to 220°C/430°F, combination steam setting. If your oven has variable steam settings, use 50% (if not, don’t worry! Just set to your oven to combi steam and don’t worry about the percentages). Combine half the onion with the minced meat, breadcrumbs, cheese and egg in a bowl and mix with clean hands to combine. 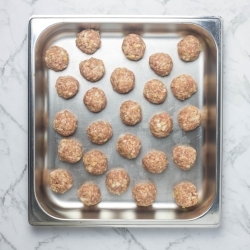 Form the mixture into approximately 24 tablespoon-sized meatballs and place onto a solid pan. My absolute favourite tool for this is a cookie/ice cream scoop (the smallest one from this set), because it’s fast and you’ll get a consistent meatball size. Cook the meatballs until they’re beginning to brown, about 12 minutes. While they’re cooking, mix the remaining onion and the garlic in a small bowl. When the meatballs are browned, remove pan from oven, move the meatballs to one side of the pan and add the remaining onion and the garlic, mixing with any pan juices and spreading them out to make a thin, even layer. Return pan to oven until the onion and garlic are softened, about 5 minutes. Reduce the oven temperature to 160°C/320°F. Add the tomato passata or crushed tomatoes and half a cup of water to the pan, then mix to combine everything. Cook for a further 30 minutes, giving it a mix halfway through and adding a little extra water if the sauce looks too thick. Serve the meatballs with cooked spaghetti and top with extra parmesan cheese and basil leaves. Preheat oven to 220°C/430°F, fan forced/convection setting. Combine half the onion with the minced meat, breadcrumbs, cheese and egg in a bowl and mix with clean hands to combine. Form the mixture into approximately 24 tablespoon-sized meatballs and place onto a solid pan. My absolute favourite tool for this is a cookie/ice cream scoop, (the smallest one from this set) because it’s fast and you get a consistent meatball size. Cook the meatballs until they’re beginning to brown, about 10 minutes. While they’re cooking, mix the remaining onion and the garlic in a small bowl. When the meatballs are browned, remove pan from oven, move the meatballs to one side of the pan and add the remaining onion and the garlic, mixing with any pan juices and spreading them out to make a thin, even layer. Return to oven until the onion and garlic are softened, about 5 minutes. Reduce the oven temperature to 180°C/350°F. Add the tomato passata or crushed tomatoes and a cup of water to the pan, then mix to combine. Cook for a further 30-40 minutes, giving it a mix halfway through and adding extra water if the sauce looks too thick. Serve the meatballs with cooked spaghetti and top with extra parmesan cheese and basil leaves. Would you like more Steam and Bake recipes and steam oven inspiration? Join the mailing list – there’s no spam, just an email every now and then to tell you the latest. When you sign up, you’ll get an invite to the exclusive subscribers-only Combi Steam Cooking Facebook group, which is full of people at all stages of their combi steam journeys, and with many different brands of oven. It’s a friendly, helpful space to learn and share with one another, and I’m often in there answering questions and sharing tips. If you’re after more delicious combi steam dinner recipes, the Easy Meals index page has plenty. For something else meatball-esque, try my steam oven version of Jamie Oliver’s Beef Kofta Curry; if your family loves one-bowl noodle dinners this Sticky Sesame Chicken is a winner; or for something different, try one of this year’s most popular posts, my Almond Crumbed Fish with Sweet Potato Chips.